Could This Tax on Wall Street Turn Back America’s Tide of Inequality? A tax on speculative financial transactions could bring in as much as $350 billion per year. Still, forty-six years after Dr. King’s murder, the gulf between haves and have-nots is wider than ever. During the 2009–10 recovery, for example, incomes for one-percenters rose by 11.6 percent, while everyone else saw theirs grow by 0.2 percent. Worse still, too many in Congress are colluding with the haves to make sure things stay that way. Our nation’s capital, both political and monetary is moving in the wrong direction. “We need to have real revenue, not just have one austerity measure after another,” says Charles Idelson, Communications Director for National Nurses United. “The last thing the American people need is more austerity. 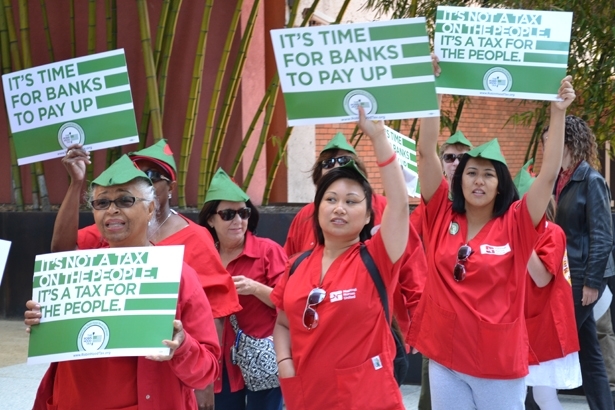 Much of the country is still in a recession.” That revenue might be found in a Robin Hood Tax. Your voice matters, and your participation can be powerful. It’s high time to question the inevitability of Wall Street and Congress’s friends-with-benefits relationship. And there is cause for cautious optimism. Recently, Robin Hood Tax proponents found some ammunition in an unlikely place: Dave Camp (R-MI), Chairman of House Ways and Means Committee. Within his larger tax-reform plan, Camp has proposed a 0.035 percent quarterly tax on bank assets for institutions with assets in excess of $500 billion (i.e., the too-big-to-fail fraternity). The takeaway here is not so much the tax itself (which is part of a generally undesirable slate of proposals), but the fact that it derives from a GOP congressman. “For FTT supporters,” says Sarah Anderson of the Institute for Policy Studies, “this creates an opportunity to say that there is bipartisan support for taxing the financial sector.” Unlike the Robin Hood Tax, Camp’s proposal taxes assets, not transactions, but still, Anderson points out, “[I]t’s the first time we’ve had Republican support for increasing financial sector taxation.” That Wall Street hates it is a good sign: Goldman Sachs even canceled a GOP fundraiser in protest. So this April 4, join the nation’s nurses and demand that America commit to Dr. King’s ideals. Petition your representative to support HR 1579. We can achieve economic justice in this country, but only if we put forth the same broad, sustained effort that Wall Street uses to get its way. It doesn’t have to be just the banks that are too big to fail.